A unique photo exhibition which aims to change public perception of people recovering from drug and alcohol problems has opened in Doncaster. Local artist and photographer Les Monaghan was commissioned to create the ‘Faces of Recovery’ exhibition in the entrance of Doncaster Central Library to highlight addiction, promote recovery and reduce stigma by Rotherham Doncaster and South Humber NHS Foundation Trust (RDaSH), in partnership with Doncaster Council (DMBC) Public Health. It features 12 life-size portraits of people who have experienced addiction and each one is accompanied by a few heartfelt words written by each person describing their feelings about their individual recovery. RDaSH Assistant Director of Drug and Alcohol Services Ian Joustra said: “There is a huge stigma associated with people recovering from drug and alcohol problems. Despite being a recognised medical condition, there is still an overwhelming view that it is down to some kind of moral failing or weakness. “The theme of this exhibition is it can happen to anyone. Some of the people featured have had successful lives and jobs, but due to their addiction have lost everything. DMBC Public Health Improvement Officer Andy Collins said: “There are over 2,500 Doncaster people in treatment for drug or alcohol misuse. For these people, learning to live again without the need to take substances is an ongoing challenge. 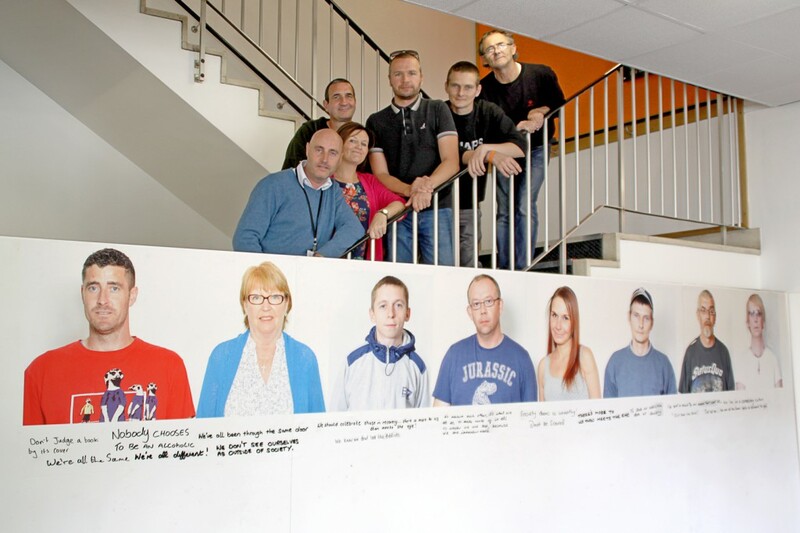 The free exhibition is open now to coincide with Recovery Week in Doncaster (7 to 12 September), and will remain open until the end of September. DMBC Public Health Improvement Officer Andy Collins (left), DDAS Worker Sally Hickson-Clark (second left) and Artist Les Monaghan (fourth left) with Jason Davis (third from left), Stephen Kennedy (second right) and Richard Greening (right) who feature in the exhibition. Aspire drug and alcohol service is a partnership between Rotherham Doncaster and South Humber NHS Foundation Trust (RDaSH) and The Alcohol and Drug Service (ADS).